I’ve heard a few times about quantum mechanics, from friends and TV show/series (Bing Bang Theory, Fringe …) that make references about this weird subject. Since this time, I put quantum mechanics on my “to-learn” list. I also wanted to know quantum mechanics in order to understand the developments of quantum computing which is likely to be the future of IT (it will be one of my next articles). I first tried to learn it by reading articles on Wikipedia but I quickly stopped because the subject is spread on too many articles and some pages are (very) hard to understand for a non-physicist. This is why I watched a 10-lecture course on YouTube about Quantum Mechanics by Leonard Susskind. Those videos are records of a continuing education course from 2008 at Stanford. I’ve chosen this course because of Leonard Susskind’s reputation and the fact that it’s a community course and therefore not destined to physics (under)graduate students. 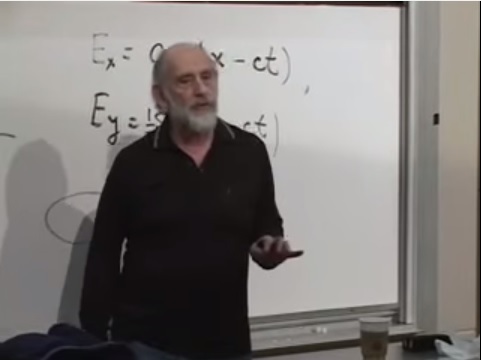 Though Leonard Susskind (quickly) explains all those concepts, if you’ve never learned/seen most of them before (especially the mathematical ones and some physical ones like polarization) it will require a lot of work and re-watching to really understand the lectures. You can still skip the parts you don’t understand but if you skip too many parts without getting at least the overall idea you won’t understand the course. The second one is a reminder of mathematical concepts: vector space (orthogonal and orthonormal bases, scalar product, linear operators), complex number, ket and bra vectors, He also gives some concrete examples of linear operators. The third one continues on mathematical concepts: Hermitian operators, Eigen vector/value. It follows with the (mathematical) postulates of quantum mechanics with a physical interpretation. The rest of the course is about the position and momentum mathematical/physical operators with a focus on the position operator (and its physical interpretation). The fourth one introduces the Dirac function and focus on the mathematical momentum operator. Susskind ends with a physical example of what this operator means. The fifth one presents 2 mathematical concepts: the outer product between 2 vectors and the Fourier transform that links the position with the momentum. Then the lecturer recalls some physical concepts: electromagnetic fields, photons and polarization, and ends with a definition of the quantum polarization state and the quantum polarization operator. The sixth one continues on (linear) photon polarization and photon circular polarization that involves complex numbers. The course ends with the concept of expected values (the average value of an observable). The seventh one starts with a comparison between a classical mechanics problem and a quantum one. Susskind introduces the concept of phase. The rest of the lecture is about how quantum states change with time and change with each other (quantum entanglement). This part introduces new math concepts: Hermitian conjugate and unitary operator. The eight one continues on how the quantum states changes with time using a new mathematical concept: Hamiltonian operators. It also introduces Schrödinger’s equations. The ninth one starts with a (very good) speak on the history of QM and then continues with Schrödinger’s equations. It ends with studying how a wave packet moves in time that links QM with classical mechanics. The last one is an application of the concepts learned during the course by analyzing the quantum harmonic oscillator. I took this course to have a good understanding of quantum physics and I’m satisfied. Before this course, I knew nothing about quantum mechanics. Now, I can read technical papers/articles on this subject and understand the ideas. The last time I studied advanced physics and mathematics was in 2007 and the “light” explanations from Leonard Susskind were enough to make me remember most of my old courses. Concerning the difficulty, I watched another online course from Stanford (Coursera) on machine learning (that also involves heavy mathematics) and the difficulty of Leonard Susskind’s course is way above Andrew Ng’s famous course. I had to watch some part multiple times to understand them (or just get the overall idea), especially in the last lectures. Though I didn’t carefully understand every mathematical proof, I got the overall idea thanks to Leonard Susskind’s explanations. It’s a very detailed course and not a “it’s too difficult, but trust me this is the truth” course. If you follow it carefully you’ll have a deep understanding of the subject (but won’t be an expert). Each lecture starts with a summary of the previous lecture so that you can watch the course on multiple months without forgetting the previous concepts. It’s free (the “live” course cost 350$). In my opinion, this course focuses too much on the (heavy) mathematical part of quantum mechanics and not enough on the physical interpretation. This course has approximately a 85/15 ratio. Although QM involves a lot of math, I wonder if a 70/30 would have been possible (especially for a “simplified” course). The course requires a high level of abstraction (I can’t tell if it’s because of the teacher or the subject itself). The questions from students are sometimes difficult to hear since the micro is on the teacher. The video has a low resolution (240p) and is too dark. However, It doesn’t prevent from reading the whiteboard. For physics enthusiasts with a good knowledge on physics and mathematics this course is good, but not great due to a (too) strong focus on the mathematical parts. If you don’t know more than 70% of the concepts I used in the course overview, you should learn more about physics and/or mathematics before watching this course. For physicists (or physics students), this course can be helpful to have another point of view of quantum physics but I don’t think that it is sufficient to be a stand-alone course. Concerning quantum mechanics, I’m more confused than before starting the course. Unlike all the physics subjects I learned when I was student (Newton’s laws, electricity, electromagnetisms, thermodynamics …), it is counter intuitive and the physicals results are just consequences of mathematical theories applied on a set of axioms. Though some results can really be observed since the end of the 20th century (like the dual particle-like and wave-like behavior that works only at quantum level or the quantum entanglement) they don’t make sense to me. I feel like there is a missing piece in this theory, the one that would explain why the quantum world behaves like it does. Like Richard Feynman -one of the greatest minds in QM- said “If you think you understand quantum mechanics, you don’t understand quantum mechanics.”. How to conduct technical interviews? What is a good application? Susakind himself sees physics in the way he taught it. To him it is all about consequences of the mathematics confirmed or discomformd by experiment. And if you think about it, classical physics is unbelievable because it’s too good to be true. I always knew, ever since I was old enough to be aware of physics as a little kid, that Newtonian mechanics couldn’t possibly be the full story. It was obviously wrong in my mind, after all, reality is not made of rectangles and surfaces are not smooth without friction (in fact, there exist no rectangles in nature). So in my mind I always knew intuitively that reality was significantly more complex, and actually, quantum mechanics seems way more intuitively correct that classical physics. That seems obvious. But to see this you probably have to study the Philosophy of Mathematics first, and understand that completely in order to understand Susskind’s view of physics. It’s an amazing thing that he intuitively understands the key concepts of philosophy of mathematics without ever formally studying the field (unless he did take a graduate seminar on philosophy of math at one point in grad school; and maybe he did). I don’t know your scholar background but usually quantum mechanics is advanced subject seen in L3 or M1 (last year of bachelor, first year of master for non french reader). Many concepts you list as hard to understand (sorry basic, not advanced linear algebra, classical physics,…) are *prerequisites* for quantum mechanics and are well known by the students who study the field. Quantum mechanics is an advanced topic which can be *very* misleading if you follow the common sense and the usual rules from the macroscopic world. Put the emphasis on a strong mathematical analysis is mandatory to ensure that one is not saying utter crap. R. Feynman, one of the greatest physicist said that “I think I can safely say that nobody understands quantum mechanics”. Famous physicists have debated over the meaning of quantum mechanics, quantum experiments and the true nature of reality. See the Copenhagen interpretation, the Many-worlds interpretation, … You can read “Le grand roman de la physique quantique” from Manjit Kumar for a historical point of view and see all the debates the quantum world has sparked. For many years, physicists have use the dirac’s “function” without a formal definition and everything was just fine. The formal defintion for dirac’s “function” was only introduced by Laurent Schwartz in the 50′. As an undergraduate student I did something typically French. It’s a 2-year undergrad class which prepares students for the entrance exams to the French “Grandes Ecoles”. It’s an intensive mathematical course (16H /w) and physical course (10H/w). It should be equivalent to a L3 (last year of bachelor) in mathematics and a L2 (second year of bachelor) in physics. I like abstraction but quantum mechanics is the most abstract course I’ve ever watched. Since quantum computing is a field I really like, I think I’ll watch another course to have a better understanding of QM before I do a in-depth study of quantum computing. Try Susskind’s ‘Advanced Quantum Mechanics’ which follows this first course and is equivalent to an upper division course on QM. Alternatively, though in my opinion less good, you could try MIT’s open courseware 8.04 which is Intro to Quantum Mechanics for physics majors at MIT. It’s free on YouTube as well. I find the two courses complement each other, but Susskind’s course is on another level. Learning a real course for physics students will help you appreciate just how good Susskind’s course really is, and shine light on how deep your understanding really is from his course by seeing the material in a different way.